Odawara, Japan, 2018-Jun-22 — /Travel PR News/ — The 27th Odawara Lantern Festival will take place on Saturday, July 28 and Sunday, July 29 at Odawara Castle Park. The festival celebrates the “Odawara Lantern.” The lanterns have a strong historical and cultural connection to the city. In the old days, the lanterns were created in the City of Odawara for people traveling on foot between Tokyo and Kyoto on the famous Tokaido Road. It was designed to be conveniently carried around by travelers through the steep and harsh roads of the Hakone mountains. The Odawara Lantern is famous for its shape because it is made of paper that can be folded up like an accordion when not in use. 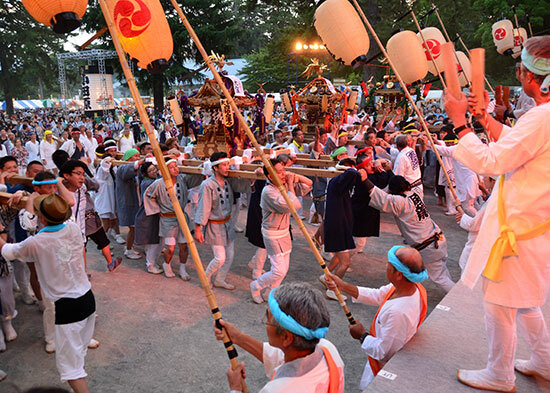 On both dates, you can enjoy a number of events including a paper lantern dance competition, a taiko drum performance, a mikoshi (portable shrine) parade, and more. About 2,000 paper lanterns made by local elementary school children will be displayed along the moat of Odawara Castle Park. There will be a countdown starting around 6:50PM on Saturday, where the lanterns will be lit up at all once. The glowing lanterns reflected on the water create are a beautiful site in the evening. Make your own Odawara Lantern. A great craft experience to make and take home your own lantern for 1,000 yen! At the workshop booth, local instructors will teach you how to create and design an Odawara lantern. In the end, you get to take the lantern with you as a souvenir. Enjoy the powerful and dramatic demonstration of a Wadaiko (Japanese drum) stage performance! Wadaiko is known as a local performing art in Odawara. A parade of around 20 mikoshi (portable shrines) is a must-see for this festival, which is followed by a thrilling competition among the mikoshi groups in the town. The mikoshi are carried at great speed along a course, at the end of which the bearers have to suddenly stop without crashing! This entry was posted in Entertainment, Festivals and Events, Recreation, Tourism, Travel, Travel Marketing, Travel Services, Travelers and tagged event, festival, Japan, odawara, tour, tourism, travel. Bookmark the permalink.